Eyedea Worx offers comprehensive premastering, mastering and replication services for both High Definition formats, Blu-ray Disc and HD-DVD. Blu-ray, also known as Blu-ray Disc (BD), is the name of the next-generation optical disc format jointly developed by the Blu-ray Disc Association (BDA), a group of the world's leading consumer electronics, personal computer and media manufacturers (including Apple, Dell, Hitachi, HP, JVC, LG, Mitsubishi, Panasonic, Pioneer, Philips, Samsung, Sharp, Sony, TDK and Thomson). The format was developed to enable recording, rewriting and playback of high-definition video (HD), as well as storing large amounts of data. Blu-ray offers more than five times the storage capacity of traditional DVDs and can hold up to 25GB on a single-layer disc and 50GB on a dual-layer disc. 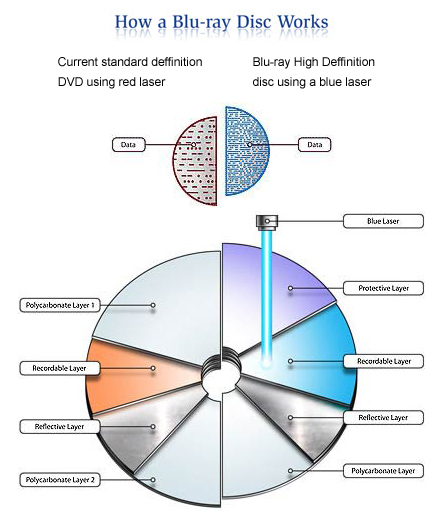 The Blu-ray Disc format is easily extendable, it includes support for multi-layer discs, which will allow the storage capacity to be increased to 100GB-200GB (25GB per layer) in the future simply by adding more layers to the discs. This extra capacity combined with the use of advanced video and audio codecs offers consumers an unprecedented HD experience. Blu-ray 25 (25 GB single layer), next generation to support 100 GB. Blu-ray 50 (50 GB dual layer), next generation to support 200 GB. All of our replicated discs are inspected for defects, and measurements are taken from samples to ensure that the highest quality standards are maintained. Discs replicated are bit-for-bit tested with the original and also inserted into several players & drives to test functionality. We offer up to five colors using high quality silk-screen printers or offset printing. UV cured inks allows a high quality, durable label to be added to any HD-DVD Replication. Artwork for disc labels can be created or modified at Eyedea Worx using Macintosh or PC graphics software packages. Normal turnaround time is 10-12 working days (Monday-Friday) from receipt of all materials. If your project requires an earlier than the standard turnaround time, no need to feel the pressure! Eyedea Worx offers rush project turnarounds for an additional fee. Please download our PDF Pricing Guide below for an easy reference to our Blu-Ray Replication Service. If you would like any further assistance or additional information regarding our Pricing Guide, please call 800.973.9383 or email info@eyedeaworx.com.